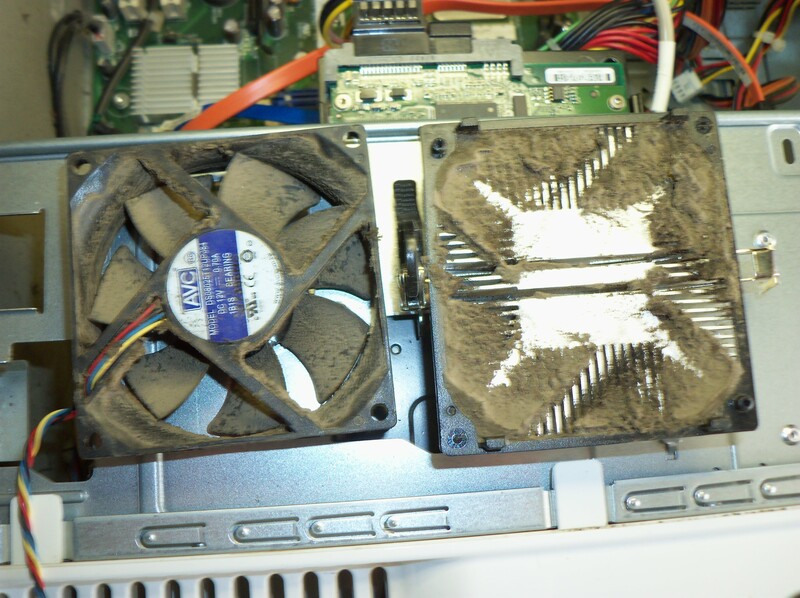 Got a PC that overheats and shuts down? Did you go out and spend $8.00 on a can of air from Radio Shack or Best Buy and blow out what you could see, and did it help? Sometimes you need to dig deeper. I was looking at a PC that would randomly make loud fan noise, then shut down. I volunteered to take it into the shop and do what I could. I thought the cause was obvious when I took the case apart. This was a Dell Inspiron desktop. Taking the side panel off revealed massive dust buildup at the front of the case. This is normally the intake for the air flow that passes through the PC, past the CPU and eventually out the back of the case, through the power supply fan and case fan. A closer look revealed that the dust buildup was also outside the metal case, but inside the front plastic panel. This snaps off easily, but check for the location of the snaps before randomly tugging at it and breaking pieces off. On this Dell, the clogging was massive, and a vacuum (cheaper than canned air, plus you’re not just moving the dust from one place to another) cleaned all this out pretty well. The CPU has a fan and a heat sink on it, and this one was all jammed up. I cleaned this up, at least all that I could see. I put the machine back together, started it up, and thought I had fixed the problem. At least it wasn’t shutting itself down any more, just doing regular things like web browsing and the ubiquitous Solitaire. But the fan would get loud once in a while, like when opening a new window. I couldn’t call this job finished without establishing if this was normal. I found that the machine had a lot of extra programs running on it. I cut the number of processes from ninety something, down to 61. Also, Mozilla Firefox had so many toolbars installed that there was barely any room for content. I disabled most of these. The fan noise was reduced and the shut downs had stopped but it still didn’t feel right. I downloaded and ran two programs to learn more. HWMonitor by CPUID collects and displays all the info about voltages, fan speeds, and component temperatures that it can access on a Windows machine. Watch out if you follow the link as it is one of those sites that tries to entice you to download everything but what you went there for. The actual download link is on the right under “Download the latest release”. There are similar programs for Linux and probably for OSX, but I won’t do those searches for you right now. UPDATE 131204 – The HWMonitor link above did not serve me well today yielding zip files that won’t unzip and executables that won’t execute, and there is an alternate download on MajorGeeks. Prime95 is software that searches for prime numbers on Windows, Linux, and OSX. It is part of a project called GIMPS, for “Great Internet Mersenne Prime Search”. Searching for primes can be CPU intensive, and the creators realized that this is a good stress testing tool, so they even built in a “Torture Test” mode. 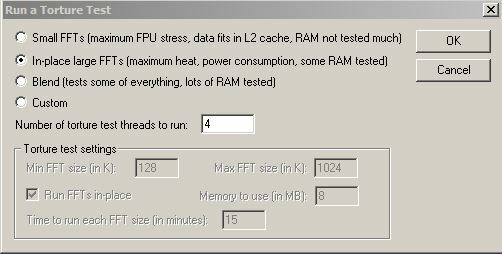 Here, I have selected “maximum heat and power consumption”. I also started a Windows Task Manager. It would normally be showing CPU usage at about 15%, and as soon as I started the Prime95 torture test, CPU usage shot to 100% and stayed there. Soon the CPU fan came on and it was loud. 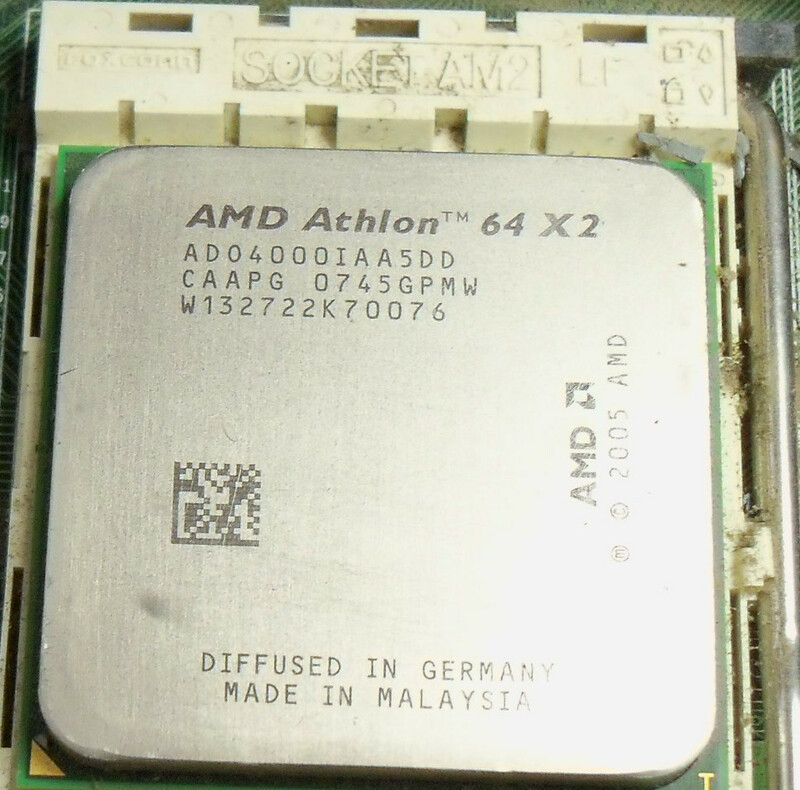 And after about 10 minutes, the CPU temperature had gone from about 37 deg C to over 100 deg C. Way over any rating for the AMD Athlon 64 X2, which would explain why it would shut down after a few minutes of this. These are the surfaces I could see before I dis-assembled the heat sink. I decided to open the machine up again and take the closer look that I should have in the first place. I had already looked at the heat sink and fan (AMD calls this an HSF, for Heat Sink Fan) and thought it looked OK, but I had not separated the fan and heat sink. And when I did, there was another dust cluster, explaining the loud noise and lack of air flow. It was not enough to just clean the dust out, now I needed to remove and replace the old thermal compound. This is a pasty substance put between the CPU and heat sink and it improves thermal conductivity. It was all dried up and some 90% alcohol and paper towels are the recommended tools for this. These are the surfaces I didn’t see! I had a half tube of Arctic Silver thermal compound leftover from another job and used it here. I put it all back together, and now Prime95 would only drive the CPU temperature to 61 deg C and the fan never went into loud mode. 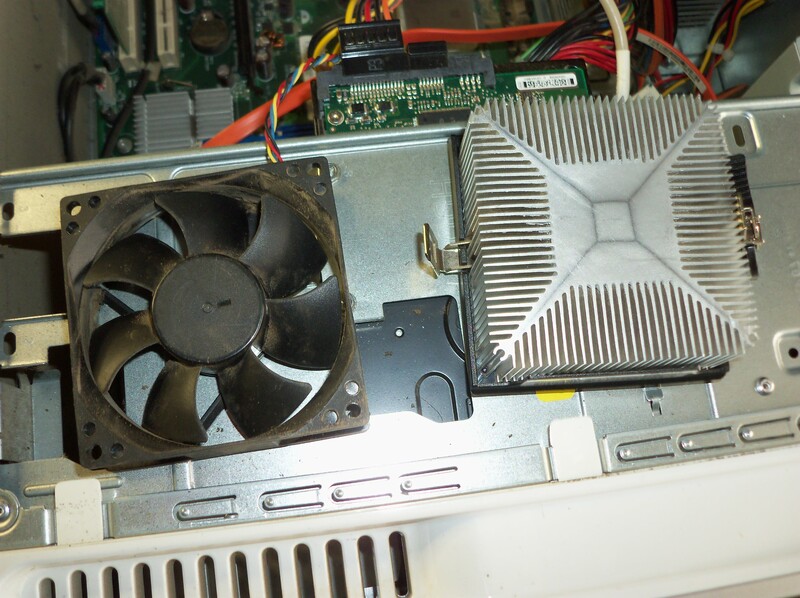 I know that it can still be loud, because when the Dell boots up, you can hear the fan spin up for maybe a second, then it shuts right down. This must be a test of fan speed, because when I initially forgot to plug the fan connector into the motherboard, the boot screen alerted me that the fan speed was low. 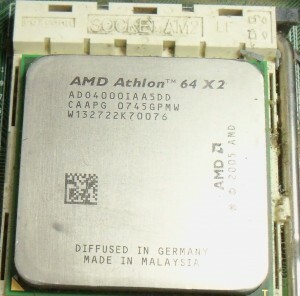 This is what the CPU should look like after cleaning and before re-applying thermal compound and the heat sink.